“A Scanda-Laugh Fest!” Betty Hutton portrays small-town, fun-loving teen “Trudy Kockenlocker” (not kidding!) in this classic Preston Sturges screwball comedy that was considered rather bawdy and somewhat controversial for its day. After Trudy attends a series of wild parties to send off the troops, she wakes up to discover herself married and pregnant – with no memory of her new husband (she thinks his name might be “Ratzkywatzky”)! Timid, insecure bank teller “Norval Jones” (Eddie Bracken) who is obsessed with Trudy, tries to help her out – leading to even more craziness, especially when he has to deal with Trudy’s curmudgeonly father, “Constable Kockenlocker” (William Demarest). The excellent supporting cast includes Diana Lynn, Porter Hall, Akim Tamiroff, Brian Donlevy, Victor Potel, Emory Parnell and Al Bridge. In his review of the film in The Nation, critic James Agee wrote, “the wildly factitious story makes comic virtues of every censor-dodging necessity. 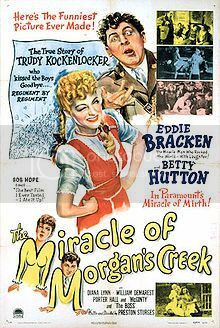 Thanks to these devices the Hays office has been either hypnotized into a liberality for which it should be thanked, or has been raped in its sleep.” The 1958 Jerry Lewis film, Rock-A-Bye Baby, was loosely based on The Miracle of Morgan’s Creek. Useless Trivia: The Miracle of Morgan’s Creek was nominated for an Academy Award for Best Original Screenplay but lost out to Wilson.